PORT ADELAIDE star Chad Wingard has been named to return against the Brisbane Lions on Sunday after passing a fitness test. 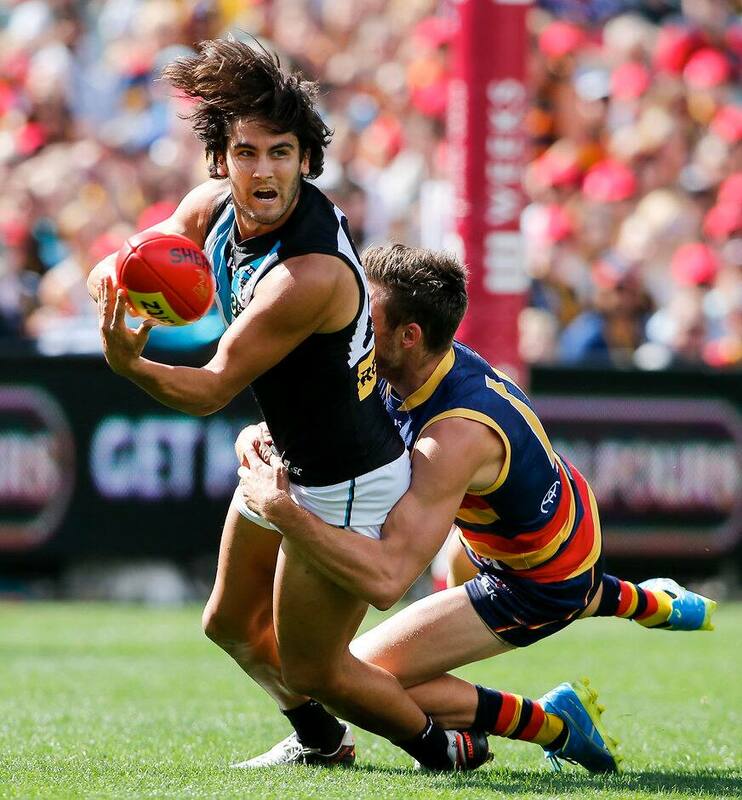 Wingard missed last week's win over Richmond due to delayed concussion and replaces Sam Gray. Port has opted not to name a specialist ruckman for the clash with the Lions. Jackson Trengove comes into the side in place of Dougal Howard and will share the duties with Justin Westhoff and Charlie Dixon. The Lions have welcomed back Dayne Beams for his first game since round 18 last year, with the prolific midfielder finally overcoming a knee injury. Josh Schache also returns after he was rested last week. Justin Leppitsch has dropped 2014 Rising Star Lewis Taylor. Liam Dawson has also missed out. North Melbourne has named Robin Nahas for Sunday's game against St Kilda after elevating the small forward to its senior list on Thursday. Nahas will cover the losses of Lindsay Thomas (suspension) and Kayne Turner (hamstring) with his speed and defensive pressure. Mason Wood has also been included for the Kangaroos. St Kilda will go in unchanged from the side that beat Melbourne last Saturday. Richmond has wielded the axe ahead of its crucial clash with Hawthorn, dropping long-time No.1 ruckman Ivan Maric and defender David Astbury, while the Hawks will blood debutant Kaiden Brand at the MCG on Friday night. The Tigers will be missing skipper Trent Cotchin (fractured cheekbone) and Kayne Lambert (punctured lung, cracked rib) as they attempt to kick-start their spluttering season against the reigning premier, but have recalled Ben Griffiths, Kamdyn McIntosh, Nick Vlastuin and Jayden Short. The Hawks ruled out defender James Frawley (concussion), with skipper Luke Hodge also sidelined after undergoing knee surgery on Tuesday. Brand, 22, will help cover Frawley's absence in defence, while Will Langford returns from a quad injury and Billy Hartung has earned a recall after spending last week in the VFL. Hawthorn omitted Kieran Lovell after he made his debut against GWS last Saturday. Carlton has welcomed back Patrick Cripps for its clash with Collingwood at the MCG on Saturday, with the midfield star overcoming the calf soreness that saw him miss the Blues' win over Essendon last Sunday. Carlton also regains veteran Andrew Walker from a calf injury and forward Andrejs Everitt returns for his first game since round two, while Nick Graham has been omitted. Jacob Weitering (shoulder) and Andrew Phillips (hamstring) could not be considered for selection. Collingwood has left out spearhead Travis Cloke for the third straight week, preferring to bolster its forward line with debutant Ben Crocker and Jesse White. The Magpies have also recalled midfielder James Aish, while key defender Nathan Brown was omitted and Ben Sinclair (concussion) and Tom Langdon (ankle) were unavailable for selection. Adelaide has recalled midfielder Brad Crouch for its game against the Western Bulldogs at Etihad Stadium on Saturday night, with Ricky Henderson also coming in for his first game of 2016. Defender Rory Laird (toe) was unavailable, while the Crows omitted Jarryd Lyons. The Bulldogs regain livewire Caleb Daniel from injury but lose improved midfielder Koby Stevens (abdominal strain), while Jack Redpath has been recalled and Lin Jong dropped. Former Kangaroo Nathan Grima has been named to make his club debut for Essendon against the Sydney Swans at the SCG on Saturday, while the Bombers have rested youngsters Darcy Parish and Kyle Langford. The Dons' other inclusions are Mark Baguley, Shaun McKernan, Craig Bird and debutant Mason Redman, while Mathew Stokes (hamstring), Martin Gleeson and Sam Grimley also go out of the side. The Swans regain reliable defender Nick Smith from injury and have omitted Aliir Aliir after his debut against the Brisbane Lions last Sunday. Fremantle has recalled experienced hands Garrick Ibbotson and Nick Suban for its clash against Greater Western Sydney at Domain Stadium on Saturday, while Ethan Hughes has been selected for his second game. The Dockers have dropped ruckman Zac Clarke, Darcy Tucker and Brady Grey, while the Giants have named an unchanged team for the first time in their five-season history after their 75-point thrashing of Hawthorn last Saturday. Geelong has omitted Nathan Vardy, Jed Bews and Jake Kolodjashnij after its 20-goal defeat of Gold Coast last Saturday night, with Andrew Mackie, Rhys Stanley and Tom Ruggles coming in to play West Coast at Simonds Stadium on Saturday. West Coast has welcomed back Elliot Yeo while Sam Butler goes out with a groin injury. Melbourne has swung the axe after its loss to St Kilda, omitting Lynden Dunn and Sam Frost for its clash against Gold Coast at Metricon Stadium on Saturday. Heritier Lumumba and Christian Salem were both ruled out with concussion, while the Dees have recalled Colin Garland, elevated rookie Viv Michie, Billy Stretch and Clayton Oliver. Gold Coast has dropped Ryan Davis and Mackenzie Willis, while experienced defender Trent McKenzie (ankle) was unavailable.The Suns have regained defender Adam Saad from injury and Jarrod Garlett, and will unveil Darcy McPherson for his debut.